The area in Western Nevada, known as "Wabuska" (a Washoe Indian word for "White Grass") has been home to hot springs for hundreds of years and became a stage stop for freight and passengers in the early 1870's. In 1959, Magma Power Co. drilled 3 steam producing wells in the vicinity. The first commercial use of the property was in 1972, when Agri-Technology began using the water and steam from the wells to heat their greenhouse tomato-growing operation. Tad's Enterprises acquired the property from Agri-Technology and in the early 1980's, constructed a geothermally operated ethanol plant. In addition to producing ethanol, Tad's experimented with aquaculture of prawns, fish, and the cultivation of blue-green algae for human health supplements. 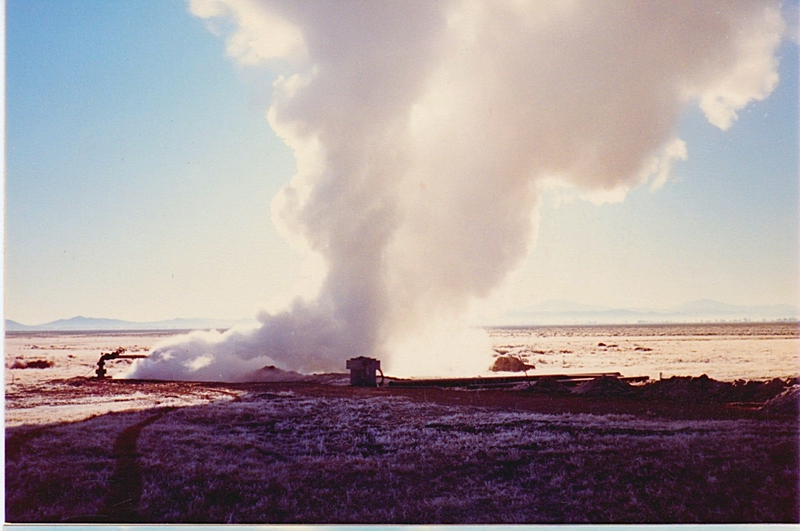 In 1984 Wabuska Unit #1 officially went on-line with the Public Utilities Commission of Nevada's permit # 001 for geothermal power generation. Wabuska 1 is a 800kw binary generating unit, using Ormat technology. In 1987, Tad's activated the 2nd 800kw unit, Wabuska 2. Following the deaths of the founding partners in the 1990's, the plant was put up for sale. Homestretch Geothermal officially began business on March 1, 2001 with the purchase of the Wabuska Geothermal Power Plant from Tad's Enterprises. Members of the Egbert family, Andrew, Cory and their parents, bought the business and created Homestretch Geothermal. The original property was 80 acres of land, some water rights, and the power plant with a contract to sell power. Within the first two years of ownership, Homestretchadded a third generator, Unit #3. Then in following years Homestretch acquired an additional 480 acres of private land, additional water rights to total 8,688 acre feet, and the geothermal lease on 4,720 acres of surrounding BLM property. In 2011, Homestretch drilled two new geothermal wells, for a total of four onsite, and added 4 more generating units for a total of seven. In 2014 an additional acreage of undeveloped land was leased to the South of the original property and a large pipeline was installed to deliver water over 3 miles to the Southeast of the plant for irrigation and cultivation of crops. With the seven generating units in operation, the nameplate rating for the power plant is 5.6 Mwh. The actual power produced averages around 2.2 Mwh gross. The limiting factor being the water temperature. Homestretch's water temperature ranges between 215-210 degrees Fahrenheit, with water being pumped from two production wells, approximately 700 feet deep. 215 degrees is generally considered cool for geothermal power production, but the cooler temperatures and shallow wells result in water that just falls short of being drinking quality. Thanks to the high quality water pumped onsite, Homestretch is permitted to surface discharge the water, creating hundreds of acres of wildife habitat. In 2015, the water was approved for agricultural uses, and Homestretch immediately began working to put the water to use, growing food for Nevadans. 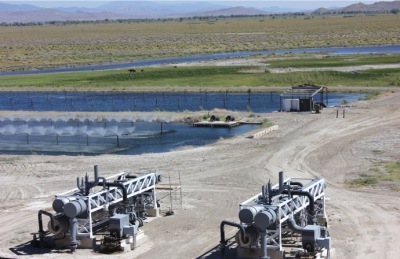 In early 2016, Homestretch expects to begin cultivating the first 200 acres of an anticipated 2,000 acre farm, using water from the geothermal wells. Andrew and Cory Egbert are native Nevadans, raised on a cattle ranch outside Wells Nevada. The skills they learned working side by side with their family, prepared them for the challenges of running the Wabuska power plant. The Egberts are owner-operators, meaning that almost all the work done onsite, from construction to maintenance, is done by Homestretch employees. Hard work and innovation have allowed the Egberts to succesfully operate and grow the business for over 14 years. Homestretch's values are tied to the owners upbringing on a small Nevada ranch. Producing something of real value, like energy and crops, that benefits our family, friends, and community, is very important to Homestretch. Doing good for our community also means doing good for the envronment. Producing clean energy for Nevada and developing natural resources go hand in hand at Homestretch. Homestretch plans to develop and expand the exisitng geothermal plant to produce more clean power for Nevada. In addition to producing more power, Homestretch is working to develop agricultural ground and produce food for Nevadans. In addition to food and power, Homestretch hopes to find and work with like-minded partners to produce more products that are of real benefit to promoting better quality of life for Nevadans.